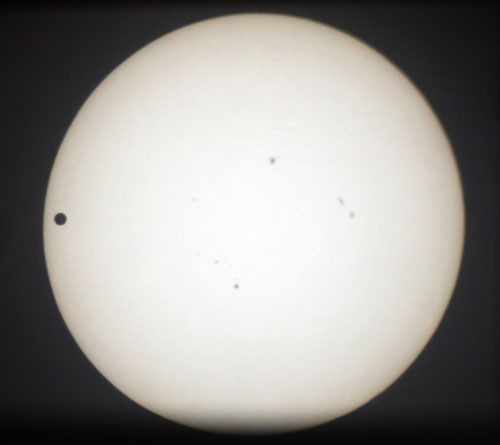 Now that I've had time to recover a little, I thought I would write up my experience organizing and running the public viewing of the June 5, 2012 Transit of Venus event. Based on my experiences with the "Mars Close Approach" event in 2003, I knew going in that it would almost certainly be a very busy day and prepared for it. The transit of Venus happens in pairs 8 years apart every 100+ years and after the one in 2012 the next chance would be December 2117. Who knows what advances in medical science will do to increase our longevity over the next 100 years, but regardless, the majority of us won't be around to see the next transit of Venus. Since the one in 2004 wasn't visible in Austin, this was basically my only chance to see it with my own eyes. And pretty much ever since the 2004 transit, the 2012 one had been on my long-term horizon as something to plan for at work. As we got closer to the day, I was contacted by the local amateur astronomy club, the Austin Astronomical Society, and the Astronomy Students Association (our undergraduate group, which I was a charter member of back in the day!) to do a joint event. This ended up working out well since it meant a lot of instruments and volunteers - and in the end we needed them all! We didn't really know how many people to expect since we weren't requiring reservations or RSVPs. I had received a few phone calls and emails but since we had the information posted on the web it was hard to predict how many people would actually come. We estimated about 1000 people came to view Mars at the 2003 event that I was using for comparison, so I wasn't too surprised that we got swamped. One of my fellow organizers was expecting a few hundred over the three hours it was visible in Austin, but in the end we estimated that about 2500 people came through the various lines. At one point the line wound its way down the stairwell from the 17th floor to the 4th floor (the ground level for my building)! The weather was the big concern going in to the day and the forecast looked a little dodgy for a while. But in the end the clouds mostly stayed away and we saw all but the last 15-20 minutes that the transit was visible in Austin. I started the day in the room that our solar telescope projects in to, but only about the first 90 minutes of the transit was going to be visible there. I was actually happy to be the person to run that since it meant I got to stay inside in the air conditioning for the hottest part of the event! The image at the top is of the view we had from the solar telescope - it's about a three foot image on the wall. Once we closed up the heliostat I set up a live stream in the auditorium and checked on the state of the line. We knew after a point that there was no way that people joining the line would be able to get to the roof in time, so that's when we started sending people to the live stream. They wouldn't get to see it with their own eyes through a telescope, but at least they got to see it and ask questions of astronomers! I went up to the roof for the last 45 minutes or so and stayed with the undergraduates (and sneaked a peek through our 8-in telescope with solar filter they were using) until the sun ducked behind the clouds about 20 minutes before sunset. I also looked at it unmagnified through a welder's glass and the dot of Venus was easily visible. I stayed around to take down signs, etc. and finally left around 9:30 p.m., completely exhausted (I logged over 12,000 steps on my pedometer), but so glad that we were able to pull off a pretty successful event!